Just PKR 53 has been received in water and sanitation aid for each person in Pakistan on average for the years 2010-2012, according to a startling new report, Bridging the Divide, released by the international development charity WaterAid on the eve of World Water Day (22 March 2014). This is despite, 15.1 million people in Pakistan (9% of the population) not having access to drinking water and those who have access are forced to drink contaminated drinking water and among those less than 3% of households have water source more than 0.5 km away from their home. In Pakistan 92.8 million (53% of the population) do not have access to improved sanitation facilities and nearly 23% (40 million) of the total population defecate in open. Pakistan will also miss its MDG target for sanitation. 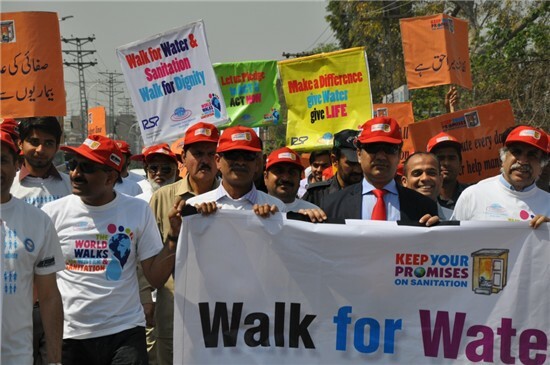 On the occasion of World Water Day, over 400 people representing communities, CSOs and academia under the “Keep Your Promises Campaign” took part in an awareness raising walk in Lahore. The participants walked to show solidarity with the people who are still without access to safe drinking water in Pakistan. The walk started from Awane Iqbal and concluded at press club Lahore, where Mr. Khalil Tahir Sindhu, Minster for Human Rights and Minorities vowed that “government will take appropriate measures for provision of safe drinking water to the people”. During another side event organised by WaterAid in Lahore, where more than 10 legislators (Mr. Ramesh Singh Arora, Mr. Ali Asghar Manda, Dr. Frazana Nazir, Ms. Saira Iftikhar, Saadia Sohail Rana, Haji Javeed Ali Ansari to name a few) of Punjab Assembly participated. The legislators shared the problems around water and sanitation in Punjab and supported the demand of universal and sustainable access to water and sanitation to all, as this is a basic human right. They agreed to form a core group of legislators to highlight agenda of clean drinking water and sanitation in the Provincial Assembly and to take appropriate legislative and governance actions to improve water, sanitation and hygiene conditions in the province.